One of the things I love about being a teacher is that once students graduate some of them become friends and mentees. This is the case of Jacob Virgil who, having graduated from UNC was backpacking around Europe when he contacted me to tell me he was in town. It has been four years since I gave a good tour of Madrid, and it was very cathartic. Visiting old favorite haunts, seeing old friends and acquaintances: eating roast chicken at Sidras Mingo by the river, having chocolate con churros at San Ginés, drinking bone dry sherry at Torre del Oro, it all brought back many memories and tears to my heart. 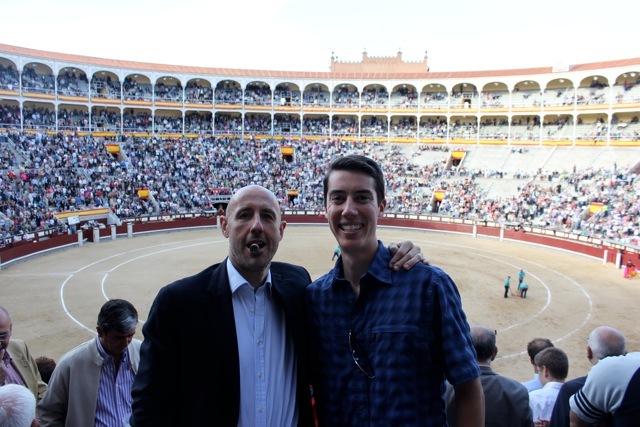 The highlight of this visit was taking Jacob to the bullfight. 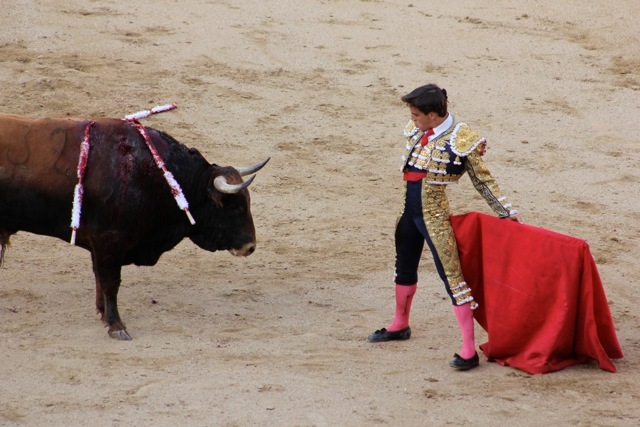 It was a Monday afternoon fight, so I managed to get excellent seats, the reason being, that as a Monday fight, the bullfighters were on the younger side, not that the bulls were any better. But still, the afternoon was beautiful. 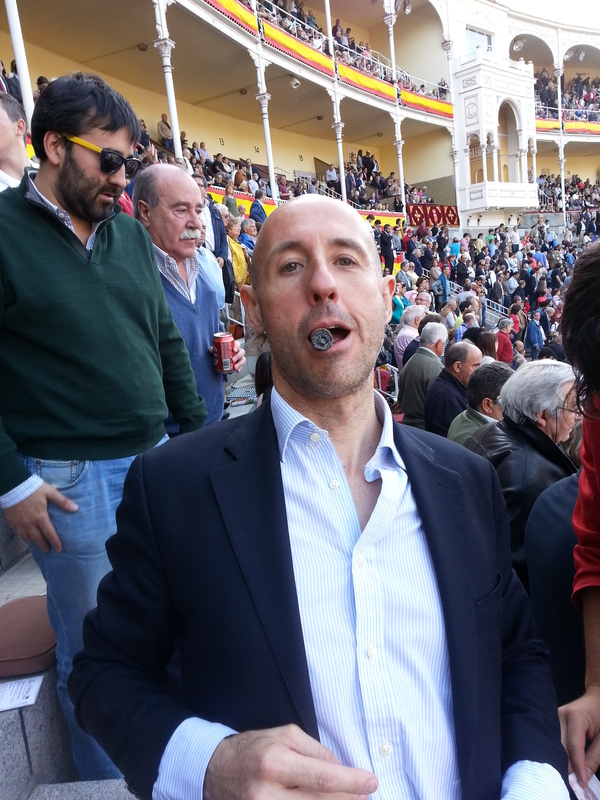 I lit up a fabulous Montecristo Petit Edmundo from my friend José at Estanco Barquillo and enjoyed the event. 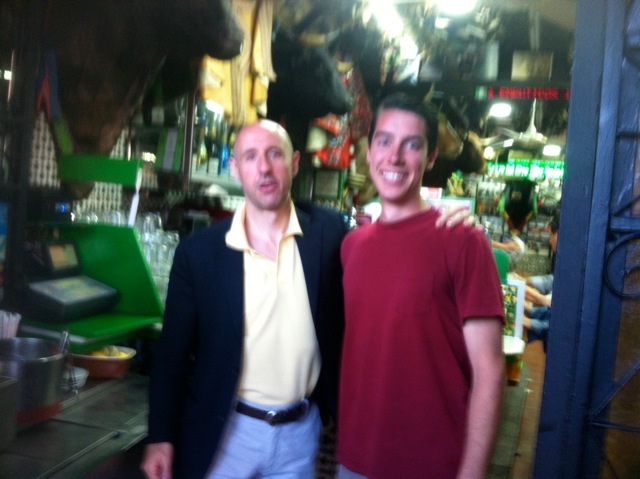 I walked Jacob back to his hotel, stopping for some great tapas at Estay in the Barrio de Salamanca district. The Biblical Jacob dreamt of a stairway to heaven. This XXI C. Jacob didn’t bring that ladder, but he nonetheless helped me in my healing process. Which was totally unexpected – as it should be. Walking around with him, visiting old haunts and especially the bullfight, helped me renew and cleanse myself. Apparently we were even given a close up shot on TV, proof, if any was needed, that they were good seats!